Ahila Sankar is a hospitality management graduate from Switzerland. She has a great passion for food, especially Asian. Ahila started cooking when she was 6 under her mother's supervision. 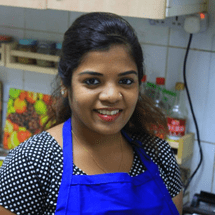 Her family has a long tradition of being vegetarians and cooking vegetarian food which inspired Ahila to create her own recipes exclusively for the vegetarians and vegans.